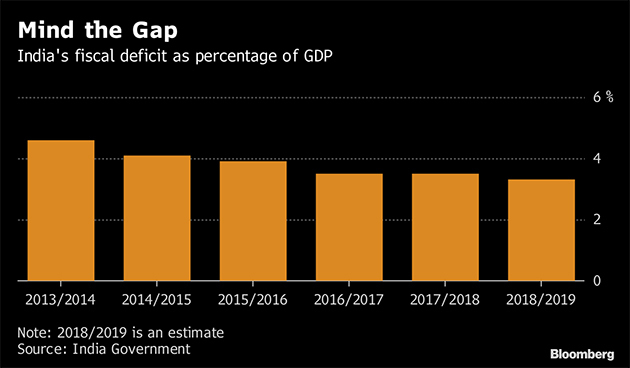 Indian Prime Minister Narendra Modi has a last-ditch attempt to win voters with possible populist spending measures in Friday’s budget, risking his debt targets in the process. Modi is feeling the heat after his ruling Bharatiya Janata Party lost control of three key states in regional elections last month, setting the stage for a contentious national vote that’s due by May. He’s coming under pressure from a resurgent opposition, which is going all out to lure voters with debt waivers for farmers and pledges of welfare grants for the poor. Speculation is swirling that Modi’s fiscal plan includes a cash transfer program for farmers entailing an additional spending of 700 billion rupees ($9.8 billion), support for small businesses and some reprieve for taxpayers. For investors, that translates into another breach in the budget deficit target of 3.3 percent of gross domestic product this year and possible record borrowing in the coming year. “In the event of the incumbent government staying in power or the Congress-led coalition taking over, fiscal policy will likely remain overly loose, with the deficit likely to remain well above the 3 percent comfort level,” said Prakash Sakpal, an economist at ING Groep NV in Singapore. Aside from the spending pressures, revenue growth has also under-performed, putting a strain on the government’s finances. 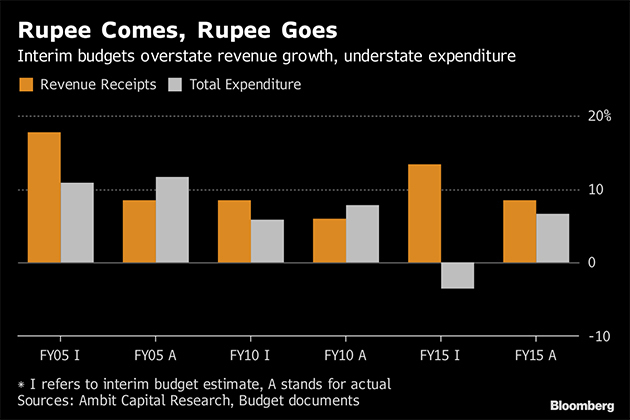 Monthly receipts from the goods-and-services tax have largely missed a 1-trillion rupee target, while income from asset sales lagged estimates. India’s fiscal deficit is forecast to widen to 3.5 percent of the gross domestic product in the year to March, and reach 3.3 percent in the next financial year, according to the median estimate in a Bloomberg survey of economists . “The fiscal deficit is already at 114.8 percent of its budgeted target, implying expenditure cuts will have to be substantial if the government is to stick to its budgeted fiscal deficit target of 3.3 percent in FY19,” said Madhavi Arora, an economist at Edelweiss Securities Pvt. When including spending and revenue from the various states, India’s deficit shoots up to 6.3 percent of GDP, according to estimates from Moody’s Investors Service. That’s one of the highest in Asia, and among the reasons the nation’s credit rating remains constrained. Bond yields have risen in four of the past five weeks, with the yield on the most-traded 2028 security increasing 15 basis points to 7.54 percent in the past month. To help make up the revenue shortfall and keep the budget deficit in check, the government may pressure the Reserve Bank of India to pay an early dividend. Some reports suggest new Governor Shaktikanta Das may be asked to stump up as much as 400 billion rupees to boost the state’s coffers. Das is also in a position to give support to the economy through interest rate cuts, providing an extra boost to Modi’s government. With inflation at an 18-month low, consumer demand weakening and global risks mounting, economists are betting the RBI will lower rates this year, possibly as early as next week. “If the government surprises by abandoning its fiscal targets, yields could rise further. This could make it harder for the Reserve Bank of India to adopt an accommodative stance.”– Abhishek Gupta, Bloomberg Economics. Piyush Goyal, who is standing in as finance minister while Arun Jaitley takes medical leave, is due to the deliver the budget speech from 11 a.m. in New Delhi on Friday. A pre-election budget usually covers the period until a new government takes office, and isn’t typically used to make major announcements, such as tax changes that would carry over into the next administration. But there’s no law that prevents Modi from making significant announcements this week.